The St. Joe Company (NYSE:JOE), Northwest Florida’s leading residential and commercial property developer, and The St. The St. Joe Company (NYSE:JOE), Northwest Florida’s leading residential and commercial property developer, and The St. Joe Community Foundation have signed an agreement with The Humane Society of the United States, Florida Fish and Wildlife Commission, and Freeport based Nokuse Plantation to support the relocation and rehabilitation of the Gopher Tortoise, one of Florida’s threatened species. 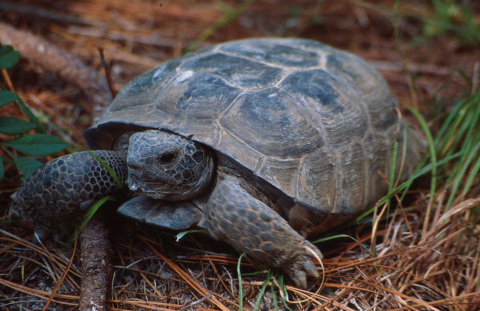 The Gopher Tortoise is unique in the way it creates its home. While most tortoises simply shelter under vegetation, the Gopher Tortoise digs and creates extensive burrows, typically up to 30 ft. These burrows are important habitats for not just the Gopher Tortoise but for other species of wildlife that share or use them too – including burrowing owls, frogs, lizards, rabbits and snakes. Many of these habitats are now threatened and the project aims to relocate more than 2000 tortoises over the next three years. The St. Joe Company has a long history of responsible stewardship of the land and environment in Northwest Florida. The St. Joe Community Foundation provides vital funds to support this effort. Since its inception, The St. Joe Community Foundation has donated in excess of $18M to charities and nonprofits in the Northwest Florida region. The Foundation has supported other environmental programs with Choctawhatchee Basin Alliance, E.O. Wilson Biophilia Center, South Walton Turtle Watch as well as environmental activities with local schools. The Gopher Tortoise will be rehoused on land at the Nokuse Plantation, a 53,000 acre preserve located in Walton County, Florida and owned by Mr. M.C. Davis. Nokuse is dedicated to the preservation, protection, and restoration of Florida's native species, including gopher tortoises. “The gopher tortoise is considered a keystone species and is an essential part of our overall restoration of the longleaf pine sandhill ecosystem. We are grateful to be part of this unprecedented program between The St. Joe Community Foundation, The St. Joe Company, The Humane Society of the United States, and Florida Fish and Wildlife Conservation Commission to relocate gopher tortoises from development sites throughout Florida to our preserve,” said Matt Aresco, The Nokuse Plantation’s Director. Since its inception, the St. Joe Community Foundation (STJCF) has provided more than $18 million in grants to improve the quality of life in the communities it serves. STJCF provides charitable grants primarily in Bay and Walton Counties that embrace the arts, strengthen education, protect the environment and improve healthcare. These efforts help build healthy, caring, long-lived communities. For more information, visit www.stjcf.com.